Holiday meals can be challenging with any food allergy. Thanksgiving dinner is especially challenging when living gluten-free. When I was young I was not aware that I had an issue with gluten and I still remember getting sick at every thanksgiving meal. On thanksgiving the abundance of bread, stuffing, gravy and pie most likely had been the cause for my illness. Over the past few years it has become a tradition for me to host thanksgiving. 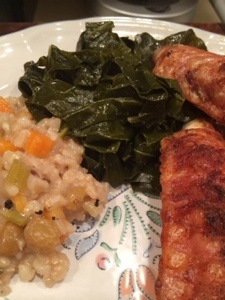 Cooking the meal myself makes it very easy to create a safe gluten free meal. Being gluten free should not prevent anyone from sharing a meal with friends and family. The easiest solution is hosting the meal so that you are aware of all prep and ingredients. Being a gluten free guest doesn’t have to be impossible. With a little preparation it’s easy to make a safe meal for everyone. The most important thing is to let the host know about your concerns and offer to provide what ever may be needed. 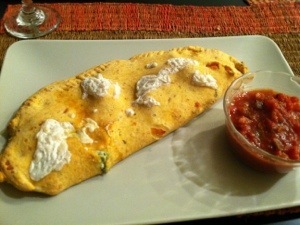 Below I have provided great tips and some recipes that are easy crowd pleasures. Quick Tip For A Safe Gluten-Free Dinner! -Make sure all broth used for cooking is gluten free. 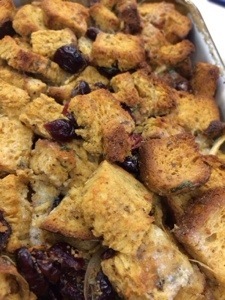 – Make sure stuffing is made on the side and that bread containing gluten is not stuffed inside the turkey. – Most gravy mix is not gluten free. You can use cornstarch to make your own gravy. – Don’t be embarrassed to share your concerns with a dinner host. By communicating ahead of time it will make it easier to plan. – Beware of canned cranberry sauce and read the ingredients first. Making cranberry sauce from scratch is with fresh cranberries, orange juice and sugar. -Traditional green bean casserole is not gluten free. The canned mushroom soup and crispy onion topping both contain wheat. -Educate your family on cross contamination so they understand not to mix spoons and serving utensils. – When in need of a quick gluten free crust, try simple blending some gluten free cookies and butter together and pressing into a pie dish. – Common dish that a normally gluten free include pumpkin soup, mashed potatoes, turkey with on gravy, greens, sweet potatoes and unglazed ham. Gluten free stuffing mix is hard to find. Making it your self is easy. Try this recipe and no one will ever know its gluten free. Bake bread cubes at 400 degrees from about 8-10 minutes. Remove for oven and let cool. While cooling, melt the butter and sauté the onion, carrot and celery. Allow veggies to cool. Combine everything in a large bowl. Add dry herbs and fruit. Mix it all together by hand. To put it all together start by adding broth to the bread mixture. 1/2 cup at a time until the bread is moist but not soggy. Add the egg and mix all together. Place mixture in a sprayed baking dish and bake for 30 minutes. Once golden brown remove and serve hot. Cranberry sauce is easy to make. Forget the artificial store bought stuff and make your own. Place cranberries, sugar, orange juice, zest and wine in a small pot. Cook on medium heat and stir continuously. The sauce will quickly combine and berries will start to pop. It’s important not to cook longer than 15 minutes in order to keep some of the pectin firm. 15 minutes is plenty of time for the cranberries to cook down and for everything to combine. Remove from heat and allow cooling in fridge. Once cool add applesauce and port. With thanksgiving around the corner I am always look for new recipes. Greens are classic, easy and very inexpensive. You can even make them vegetarian if needed. Start by preparing the greens. For each leaf you need to pull the green part off each side of the thick hard center stem. Discard the stems and save the leaves in a bowl. Wash or soak the leaves in cold water. Now take about 6 leaves and lay them on top of each other. Then roll them into a tight roll and slice round about 1/2 inch wide. This will give long ribbon like strips. Do this to all the leaves and set aside. Now, in a large pot bring broth, water, salt, garlic powder, vinegar and chipolte powder to a boil. Toss in all the cuts greens. Lower temp so the liquid hits a high simmer and cover the pot. Cook for thirty minutes and then stir. Add butter and continue to cook and additional 30-45 min stirring occasionally. Serve hot with a little broth on top. Enjoy!!! With a chill in the air I get very excited to start making soups. Recently I had a great soup at an indian restaurant and it inspired me to create something similar on my own. Packed with fruit and veggies this soups is not only delicious but also gluten free, dairy free, paleo and vegan! 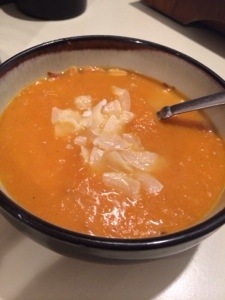 In a slow cooker a carrot, ginger and apple. Then add gram masala, salt, pepper and mix together. Then pour in coconut milk and water. Last add cardamon seeds, stir and place lid on top. Cook on low for 10 hours. Remove cardamon seeds and place on side. Pure soup with a handheld food immerser or blender. Place cardamon sides back into soup and continue cooking for an addition hour. Serve hot with nuts and or dried unsweet coconut on top. The possibilities are endless with this one. I choose to go with an indian spice but you can get creative. Make a great salty and crunchy snack. Great to serve with drinks or as a salad topping. 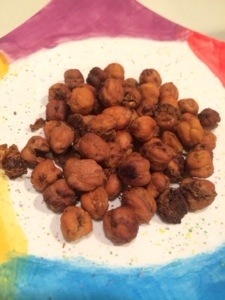 Place rinsed peas in a bowl spray with non-stick spray or oil. Add spice or herb blend and toss in bowl. Pour on to a large foiled and sprayed baking sheet. Spread everything out evenly and roast at 400 degrees for about 25 minutes. Check them continuously so they don’t burn. As thanksgiving gets closer, I am trying fun new ideas. I really don’t feel like making the turkey this year since basically I am the only one that eats it. Plus with the combination of Hanukah and thanksgiving I also want to cook up pot roast and other Hanukah treats. 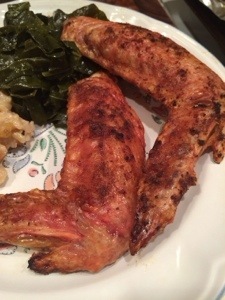 Turkey wing are easy and quick plus they are a fun treat for the whole family. Start by rinsing all the wings well. Place them in a large bowl and add all the seasonings. Mix them together so that everything is coasted in spice. Place each wing on a well foiled and sprayed baking sheet. Make sure wings do now touch and spray the tops. Bake for 60 minutes at 450 degrees. I am not sure if hamburger helper is still around. Since its not gluten free I have not looked for it in years but in college it was my go-to meal. Easy to put together and impossible to mess up. The other-day I looked into my refrigerator and I had a ton of extra gluten free macaroni leftover. I instantly was craving hamburger helper. 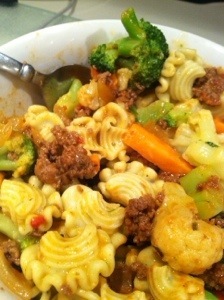 My version is low fat and packed with veggies. Start by browning onion in a large sauce pan. Once the onion begins to become translucent, add ground meat and continue to cook until meat is no longer pink. While meat is cooking heat veggies in bag as instructed on package. Return to meat and add tomato sauce, salt, pepper and garlic and mix together. Cook over low heat for a few more minutes or until liquid is almost gone. Now, toss in pasta and mix gently. Turn off the flame. Finally, add all the veggie’s and cheese sauce from the bag and mix to combine. Serve hot with grated cheese. Enjoy!!! Growing up chicken soup was the medicine for everything. 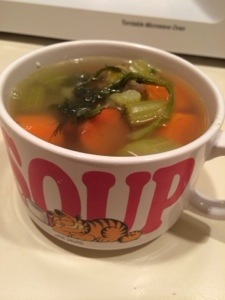 As soon as weather changed the big soup pot came out. It makes a ton of food for a week and this time if year the extra broth is great to freeze and use for the holidays. Homemade chicken broth is always gluten free, all natural and can be added to any dish. Start by bring a large pot of water to a boil. Once boiling toss in chicken, lower water to a high simmer. Let the chicken cook for an hour. Now toss in everything else and gentle stir. Leave the parsley and dill in a bunches. Let the soup cook about another 30 min or until veggies are soft. Taste and adjust seasoning. Some people like the veggies mushy and cook it longer. Now comes the messy part. You need to separate everything. Let the soup cool for a few minutes and then CAREFULLY remove the the chicken. The chicken with fall apart easily so do this carefully, you may need help. Place then chicken in a bowl and clean off all the bones and skin. Save the meat in another container and toss the rest. Then remove the dill and parsley and save some for serving. Next, carefully remove the veggies into a bowl and strain broth. I normally have about 6-8 quarts of broth. I quickly freeze half of it in different containers and then save everything else for meals. When your read to serve just heat the broth and veggies. Place shredded chicken in each bowls and top with the soup. Enjoy!!! 1/2 Cup Spinach Ricotta Spread – Sautéed onion and shredded frozen spinach, drain and add to ricotta along with salt and nutmeg. Start by making the sauce. Chop onion and carrot and sauté in a pot. While it cooks chop basil, parley and capers and add that to the pot. Mix well and add tomato’s. Bring to a simmer and stir in sugar, salt, oregano and wine. Cover and bring to a boil. Then lower to simmer and cook uncovered until the consistence you want is achieved (about 10 minutes). You will a lot of extra sauce for dipping. Now to the dough. Place all the ingredients in a bowl and kneed together by hand. Once it is well mixed I separated it into 2 big balls. But you could easily make it into 3 or 4 if you have smaller mouths to feed 🙂 . Then on a piece of tin foil, I took the first ball and worked it into a large oval shape. On one half I spread half the ricotta. Then on top of the cheese I added 1/4 cup of the now chunky sauce and then finally topped it with 1/3 Cup Mozzarella Cheese. Make sure to leave the out edge free of toppings to make sure you can seal the whole thing. Now fold the other end over to make a pocket around all the cheese and sauce. Fold over the edge and press down with a fork around the edge to seal well. Place the finished products on a ungreased foil baking sheet. Repeat again with the other ball out dough. Place both on the same baking sheet and sprinkle the remaining cheese on top. Bake at 375 for 25 minutes. Serve hot with extra sauce on the side. Enjoy.